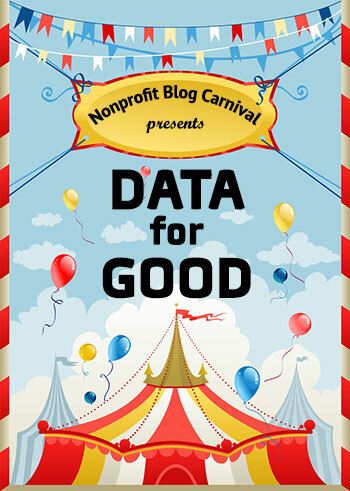 We’re the proud hosts of the June Nonprofit Blog Carnival and it’s all about data. For some non-profits, all the talk about transparency and outcomes measurement makes them feel they are on a dizzying data ride. What should you measure? How much, how often? What conclusions are you drawing and how can you best present these to your constituents? cautions around being careful about the conclusions you draw from your data. Have a look through the carnival line-up and let us know your thoughts and feedback in the comments below. I was most drawn to the revelations about how, even when we have information or data in front of us, we can make mistakes. With the nonprofit world turning more and more to collecting and basing decisions on data, the Heaths' warnings about it lit up for me. …They suggest asking, "does the data make sense?" That implies that whatever tools or analytics we use, we always have to find the patterns and question whether the information all hangs together and really produces conclusions that we can trust. …Data is good, as long as it's balanced with a very human process. WRAP is a great start. What are you doing with your non-profit data? Mission Impact Data: Once we gather data on mission impact, we can start applying it to do more work that matters, and less work that doesn’t. Failure Data: Once we’ve failed strategically, we will be bounds closer to a successful approach. Stories: And once we have learned more about the stories of the people we serve, we’ll be better prepared to serve them (and help them tell their stories) in the future. “People, who need people, are the luckiest people in the world,” sang Barbara Streisand. She almost got it right: People who need people…need data. Cause marketing needs people. And getting people involved as donors or volunteers in your cause requires data. Having the right data means taking the guesswork out of your communication. You can’t be in charge of marketing campaigns these days without being a data geek. But, the amount of data itself can be overwhelming and it can be extremely challenging to present the data in a way that makes an impact. So, what if you could present your marketing data to your Board, CEO, CMO or Supervisor in a simple, visual way and use the bird’s eye view to make quick adjustments to your tactics to gain better results? Julia suggests that “Dashboards are your answer” to help “boil down your data …to help you communicate the latest statistics and results on your marketing campaigns in real time.” The post outlines “5 questions to ask when creating your own dashboard”. Kristina Leroux (Kivi’s Nonprofit Communications Blog) asks: "Do you track any data regarding your email open rates? What about your click-through or response rates?" Kristina outlines the tips she learned in Joanna Miles’ session at the Nonprofit Technology Conference which offered advice on “how to break down data into bit-sized chunks and find simple, effective ways to analyze the most valuable metrics”. One valuable lesson she shares from the session is on “creating your own benchmarks so you know how you are doing by your own standards and can better understand why you are above or below the industry average when these reports come out.” And Kristina offers an example of how to arrive at your “benchmark open rate” for email. Gayle recommends that folks “take a look at A Guide to Actionable Measurement, released in 2010 by the Bill and Melinda Gates Foundation” for ideas on how to approach the idea of evaluation and measurement in your organization. Gayle outlines the “three frameworks to guide [your] approach to measurement:"
We do not measure everything, but we do strive to measure what matters most. The data we gather help us learn and adapt our initiatives and strategies. Michele Puzzanchera (Nonprofit Resource Memo blog) suggests: “reporting outcomes is a standard requirement for most funders of late, but many small nonprofits struggle to get the “evidence” that their funders, or donors, or board want to “prove” program effectiveness.” In her post, Michele interviews Maria Townsend, her colleague and friend who “has guided many nonprofit programs through the data collection and reporting process”. We’ve got some data on how nonprofits are behaving digitally. They’re putting up Facebook pages and starting Twitter accounts. Whoop-de-do. What we do not have is a fully fleshed out narrative that tells us why nonprofits are behaving this way, who they’re targeting with their social conversations or what they’re getting out of it. …It’s more interesting to ponder whether your organization knows how to measure if you’re reaching your intended outcomes through social channels. In other words, what are you trying to get out of the endeavor? The carnival’s in town again in July! That's it for this month's Nonprofit Blog Carnival round-up, but the fun continues in July! Craig Linton will be your host next month looking at regular giving. Check out his call for submissions over at the Fundraising Detective blog. If you want to become a “Friend of the Carnival” and receive email updates twice a month with reminders about the Nonprofit Blog Carnival - you can sign up here.